Note: so another expansion with the abbreviation of SB… just when I thought having Alexander and Alpha savage would be the only confusing thing. After watching the new trailer, I gotta say I am exciting to see what is in store. Yet there is something I am still very unsure about, and after watching the video, it suggests that players can change classes during battle. I don’t know if that means that it will be just while in a dungeon or if it is possible during a fight to help with the statics of the party.. I hope they get into more detail during the next live letter. The last patch before the next expansion. After hearing that it will be split into two parts is a relief. It not only gives me enough time to complete Alpha savage, if that will ever happen. But also to finish leveling up all my crafters and gatherers to level 70. However, with regards to Heavensward, there is still plenty of things I need to do. Freah managed to find the site; apkallufalls where you can keep track off collecting all the items in the game. My stats are currently really low but I don’t think its so bad for only playing for almost two years lol. Anyway, back to the patch. It will be interesting to see how they finish off the story for Stormblood. So far we are in a cliff hanger to see if Alphinaud is alive etc. With the new patch it brings a new dungeon, the last trial and the last Alliance raid. Meaning we will have new gear, coins, minions and orchestrion rolls to collect. In addition, we will also be allowed to travel between worlds on the current data center we are in. Of course, there are restrictions, but it all makes perfect sense. So there will be lots to play with and explore. Continuing from having to completing Stormblood savage, another thing I need to do is collect all the dogs. Admittedly, I only have the Byakko mount. I haven’t be able to roll a high enough number for Tsukuyomi or Suzaku mounts I haven’t been back to Susano or Lak Shmi to get the mounts. I haven’t even cleared Shinryu yet. So it take a weekend or two to collect them and clear Shinryu lol. The reason for collecting the dogs is for the new mount; The Nine-tailed Fox. I remember when it would pop up in Yanxia and everyone would literally flock to the site to try to collect enough of the ore to get the headband, the same for Ixion lol. It seems like forever ago now, but it was only just over a year ago. But to get a new cool mount is something to aim for. I have only been able to collect all the horses, so I haven’t got the HW Phoenix yet, but I only have two birds lol. See, now you know how behind I actually am. Now I have no real interest in trying to play this as soon as it is released. I was far more excited with Red Mage and Samurai being released for Stormblood compared to Blue Mage. I just feel like its something else that will be too time consuming as well as being really limited. 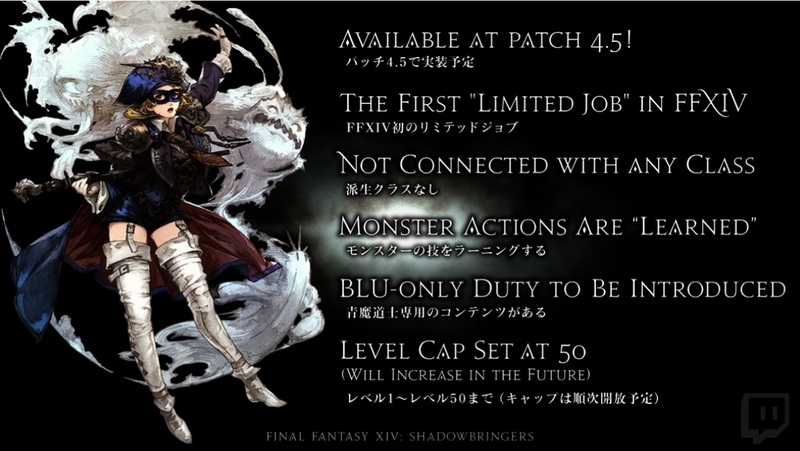 Yes it will be the first side job class, but as much as I love casters and casting spells, the lengthy process into collecting Blue Mage spells just seems annoying to me. I know it would be good to help clear fates I haven’t yet, especially the achievement fates, but otherwise… I feel there will be too many people trying it that there won’t be anything to kill. I would rather wait, see what other people say about it and then decide if I want to try it or not. For the next expansion, there will be another race for people to change into. Yet after finally finding a race that I have played as for a very long time. I feel like I am very happy with being a Lalafell. Some gear items might not look so good on a lalafell, but there are some that look really cute only on them lol. So I can safely say that I won’t be using my fantasia to change into the race when it becomes available. At least I can save my money on not buying fantasia for a while, the same can’t be said for other items on the mog station. The lalafell bike is soooo tiny its really cute!! LOL especially compared to Papa Manderville’s bike hahaha. I am also really looking forward to all the other goodies we can get at the fan fes. Looking at the goodie bag for Las Vegas, I so hope we get the same at Tokyo, the bag looks really cool and perfect for my trips to Tokyo and to Eorzea cafe LOL. Overall, I am exciting about going to the fan fes next year and to getting the new expansion in the summer. I hope I can go with friends and learn the new dungeons together. I still have to focus on the Stormblood trials and raids in the mean time.